Hidden beneath London’s Park Lane is an underground car park bristling with Ferraris, Astons and Bentleys. But they’re not getting a second look today because tucked away in a corner sits a brand new BMW i3 electric car. Built from carbon fibre and aluminium, it out-exotics the lot of them. And I’ve got the key. Or to be more truthful my minder from BMW has the key, clearly worried that I might disappear over the horizon in her new car and not come back. First impressions suggest this could be a real risk. Up the ramp, out into Park Lane’s unrelenting river of steel, and BMW’s first mega-city-car feels instantly in its element. Squash the accelerator and the car launches itself bodily forward like a salmon up a weir. Urge is instant, without a trace of hesitation. Despite skinny tyres and some slippery winter asphalt, the upfront torque of electric propulsion still makes itself felt. No car I’ve yet driven is better able to nip into a short-lived gap between blundering buses and erratic taxis. The on-paper figures of 170bhp, 250Nm and 1,195kg all look impressive enough, but it’s still arresting to learn how briskly they translate into motion along a busy street. Lift off again and the reaction is equally instant, though not quite as beguiling. 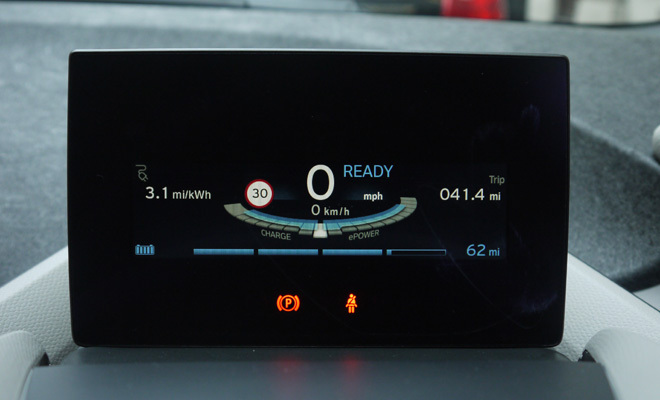 BMW has set up the i3 to aggressively recapture energy, which means it slows down quite abruptly whenever you step off the pedals. It feels horribly like someone else is pressing the brake without your prior agreement. No doubt this approach is highly efficient, ensuring that as little energy as possible is wasted even by drivers with especially heavy feet, but it is disconcerting and takes getting used to. I’d prefer to be able to tweak this setting, or indeed to choose a gliding mode, but if there is a means to adjust the regeneration level I couldn’t find it. 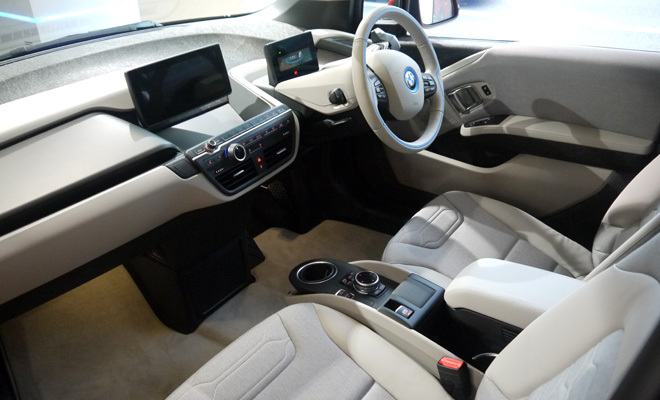 The console between the front seats does yield control over many options, via a standard BMW touch-sensitive, twist-and-prod controller combined with a wide, high-contrast central screen. 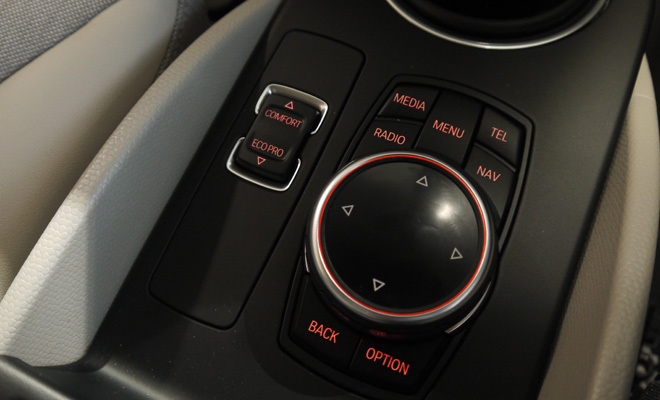 There’s also a rocker switch providing easy access to a trio of driving modes. BMW’s usual Sport option is absent but there is Comfort, Eco Pro and Eco Pro+ to choose among. The main impact of each mode is on driving range between charges, with BMW saying 80 to 100 miles is realistic in Comfort, an extra 12 or so is unlocked by Eco Pro mode, and another 13 miles on top when driven in Pro+. Throttle response is dialled back as you step through the options, while the aircon and heating will also go into hibernation mode to save energy when you arrive at the most miserly setting. I had expected the three personalities to feel like transmogrifying from hare to tortoise to slug, but in practice the switch between setups seems much more subtle. Even in Eco Pro+ mode, the i3 will still respond to a prod of throttle as if it’s been poked with a stick – at least until it hits a wall at 56mph, a barrier put in place to save energy. The other two modes will bring you to heel only at 93mph. When it comes to eking out extra miles, it’s a shame that BMW hasn’t made more of the digital instrument screen in front of the steering wheel. 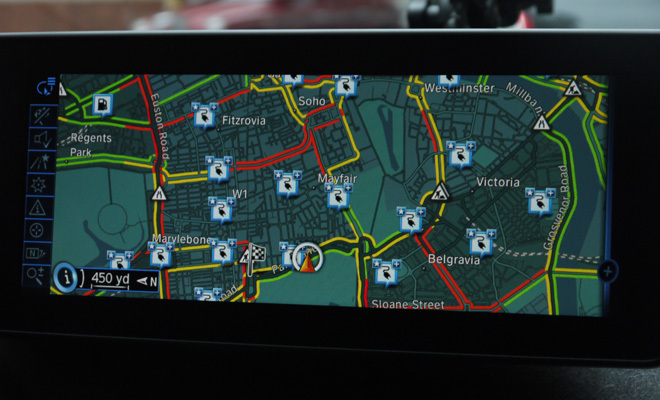 It doesn’t provide much in the way of visual feedback to assist the driver – a bold colour change you might monitor from the corner of an eye would be a blessing. 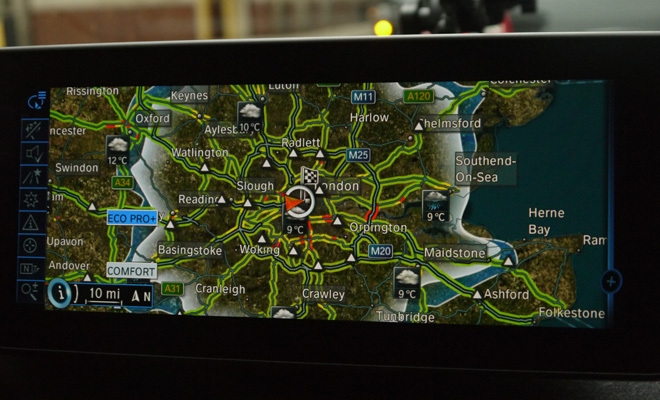 The bigger satnav screen does helpfully show the limit of where you might reach on currently available charge, in either Comfort or Eco Pro+ setting, with the projected range varying according to the roads in that particular direction. In general, go faster and you’ll run out of charge within a shorter distance, so the limit from my Central London starting point is notably curtailed along the route of the M4, for example – which ranks among the speedier ways out of town. 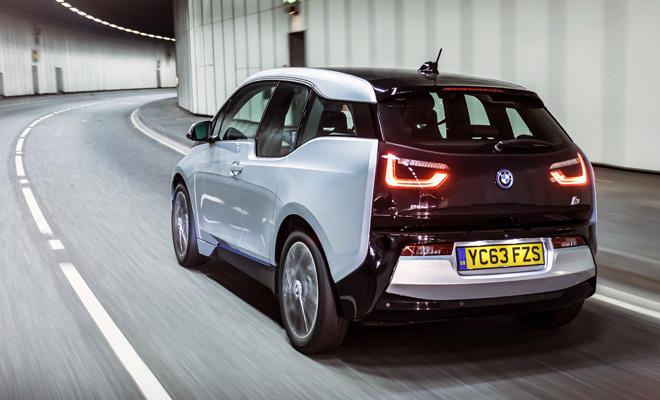 On the move, the i3 offers a level of hush unmatched by any other vehicle I’ve driven – it’s silent even by electric car standards, with very little sound from the rear-mounted motor and no creaks or squeaks at all. The library-grade silence comes despite a ride that can feel a little sharp at times. But evidently there’s enough wheel movement – or tall enough tyres – to ease away most lumps and bumps. You’d need to be an unforgiving critic to complain, even across the capital’s cratered streets. The quiet, smooth approach extends to the steering, which is light and effortless, surprisingly so for a BMW. This softness presumably reflects the i3’s urban remit, where easy parking trumps accurate cornering. And with no bulky engine under the bonnet, there’s room even for the tall, 19-inch standard wheels to nip inward and provide a properly tight turning circle. 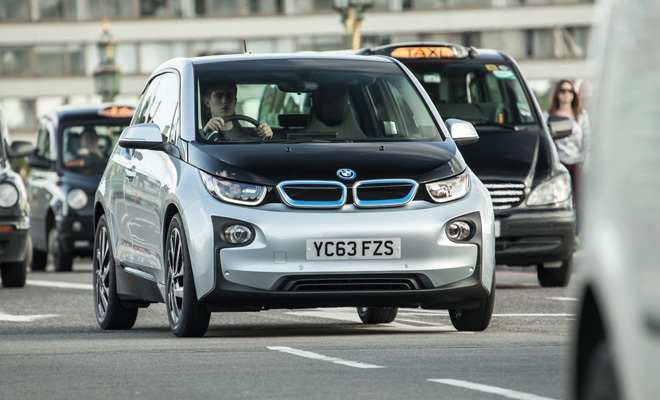 Though not quite up to black cab standards, the i3 will still U-turn in spots where other cars might demand a three-point fuss, which is always handy in the city. There is a big lump of electric motor under the boot floor, however, meaning a high load lip and a meagre luggage compartment of just 260 litres. At least the rear seats are easy to flop forwards from behind the car, while getting at the back of the cabin from the side is simple – there’s no central pillar, providing a big gap and easy access to strap in kids (or dump a coat and camera bag in my case). The rear door, hinged at the back, can be swung aside once the front has been opened. Back seat passengers, especially short ones, will appreciate the i3’s scooped window line, which helps to lend the car an airy feel inside. The deeper window also makes the i3 look as ungainly as an indignant ostrich from the outside, but at least over-the-shoulder vision is excellent. Sadly the same can’t be said in all directions. The broad, curved screen pillars could hide a double-decker or two at T-junctions, which is a disappointment given that vision is otherwise outstanding. The view ahead is helped by an elevated eyeline, compared to most other hatchbacks and city cars. 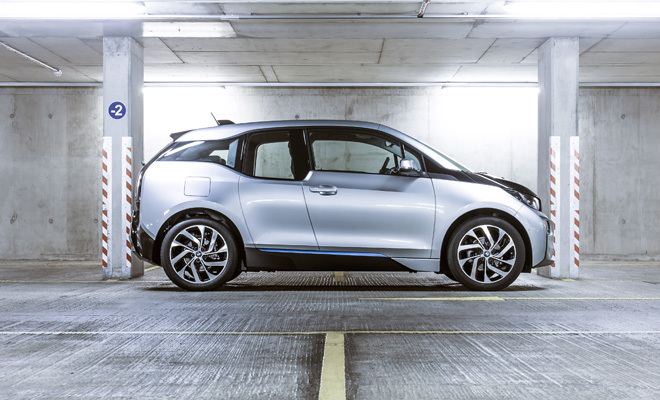 You sit tall because you’re perched above a thick layer of lithium-ion batteries of course, which lie nestled under the floor within the protective frame of the i3’s aluminium chassis. The pack holds 20kWh of energy and is kept at optimum temperature with liquid coolant, so should survive the eight years and 100,000 miles of BMW’s battery warranty. The rest of the car must make do with three years’ cover, albeit for unlimited miles. The structure of the car above the chassis is high-tech carbon fibre, decorated with bolt-on plastic panels. Open a door or lift the hatchback and you can see the carbon frame ringing the edges of the aperture. It’s not the glossy, uniform chequerboard of stuck-on fake carbon fibre but a dull, irregular, honest-looking substance. I like that you’re reminded of that underlying material every time you open a door. Inside, it’s refreshing to see recycled materials in evidence across the tops of the doors and in the sweep of dashboard below the windscreen – although the mottled grey does look a little unfinished and won’t be to everyone’s taste. Most surfaces designed to be touched are a delight, however – such as the satin-finish metal door releases, helpfully lit by LED. 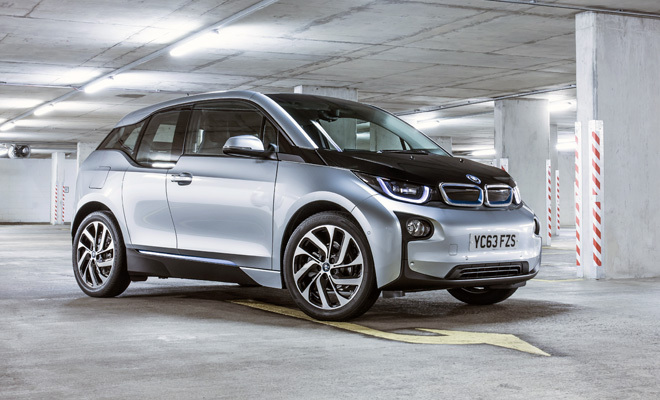 On first acquaintance, BMW’s new electric car proves utterly charming. It does have noticeable flaws, and I ought to reserve judgement until I’ve driven it for longer and on a wider variety of roads. But right now, it feels like the best electric car for the city I’ve ever driven, bar none.